Walk behind spreaders and shovels are the most common tools used to take care of snow and ice removal buildup, especially near entrances and buildings. 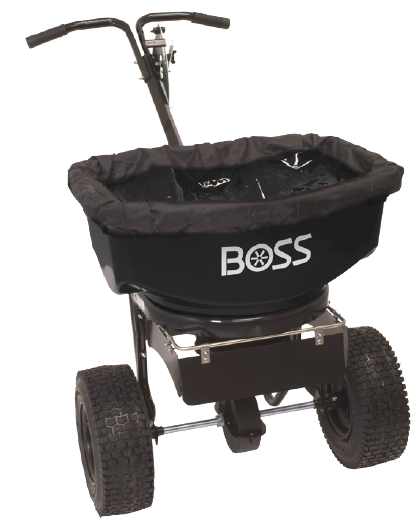 This season BOSS is introducing the NEW Broadcast Walk Behind Spreader from Chapin. This spreader is designed to withstand the elements while spreading de-icing material to clear sidewalks and walkways. Below is a list of features for the BOSS Walk Behind Spreader. Capacity: Spread up to 80 lbs. of material easily. Material Application: Partially assembled salt, ice melt, and halite. Spread Pattern: Adjustable front and side baffles for directional control of the spread pattern. Spreader Application: Auger to help agitate material and minimize clumping. Handle: Powder coated t-handle with rubber grips. Gears: Enclosed metal gears offering protection from the elements. It is important to note that before applying spreading material using the Broadcast Walk Behind Spreader, shovel and remove as much snow and ice as possible. This will allow the de-icing material to work most effectively. With the BOSS Snowplow Snow Pusher and the BOSS Broadcast Walk Behind Spreader, you will be well equipped to fulfill contracts and keep people safe!